It's Garry Shandling's Show: The Complete Series: I'm pretty sure you're tired of hearing about how much I like this show. 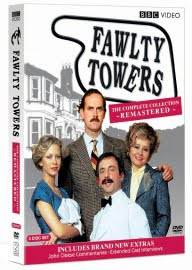 Fawlty Towers: The Complete Series Remastered: And yet, there is actually a funnier show than It's Garry Shandling's Show being released (okay, re-released) on DVD this week. And it has new commentaries and bonus features, so I guess I'm rebuying the goddamned thing. Transformers: Revenge of the Fallen: You know, I didn't see it. And yet, I'm pretty sure I can tell you that it really, truly blows.